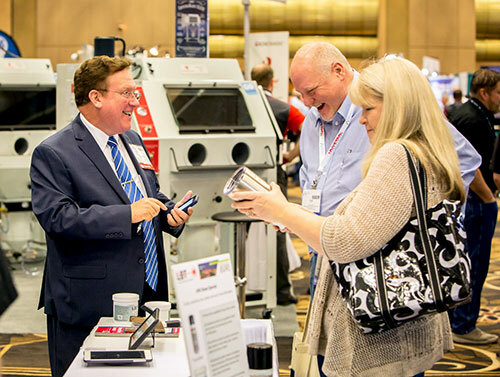 Experience it all at the Awards and Personalization Association’s expos—designed to spark ideas and connections that will boost your business. If you are looking for laser engraving equipment, sublimation suppliers, or you want to learn how to sandcarve, this is the event for you. At our show you'll not only see award products like plaques, trophies, and medals, you'll find sign making supplies, custom gift products, and apparel decorating solutions; and all of the equipment you need to decorate - laser engraving, rotatory engraving, dye-sublimation systems, sand carving, UV printing, heat presses, and more. See the newest equipment and products in the awards and personalization industry. Learn the best tips and techniques from industry experts. Get hands-on training in cutting-edge technologies. The International Awards & Personalization Expo is THE EVENT industry suppliers choose to launch their new products, equipment, and services. Join thousands of personalization professionals from more than 40 countries at the largest trade show in the awards and personalization industry! The Awards and Personalization Association represents the industry’s “best of the best”—businesses and individuals who take pride in their craftsmanship and products. Our awards program celebrates and honors their talents, time, and commitment. Learn more about our industry and products awards programs. Our East Coast Awards & Personalization Expo held October 20-21 in Oaks, PA was a huge success! Retailers enjoyed meeting new suppliers, seeing new products, industry learning in our education programs, and networking others in the awards and personalization industry. Check out our photo album and relive the excitement!